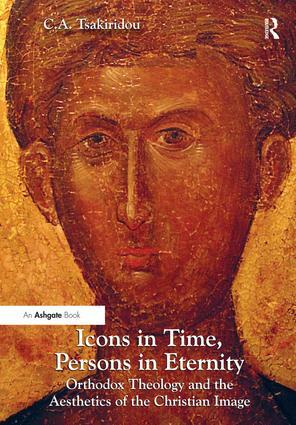 Icons in Time, Persons in Eternity presents a critical, interdisciplinary examination of contemporary theological and philosophical studies of the Christian image and redefines this within the Orthodox tradition by exploring the ontological and aesthetic implications of Orthodox ascetic and mystical theology. It finds Modernist interest in the aesthetic peculiarity of icons significant, and essential for re-evaluating their relationship to non-representational art. Drawing on classical Greek art criticism, Byzantine ekphraseis and hymnography, and the theologies of St. Maximus the Confessor, St. Symeon the New Theologian and St. Gregory Palamas, the author argues that the ancient Greek concept of enargeia best conveys the expression of theophany and theosis in art. The qualities that define enargeia - inherent liveliness, expressive autonomy and self-subsisting form - are identified in exemplary Greek and Russian icons and considered in the context of the hesychastic theology that lies at the heart of Orthodox Christianity. An Orthodox aesthetics is thus outlined that recognizes the transcendent being of art and is open to dialogue with diverse pictorial and iconographic traditions. An examination of Ch’an (Zen) art theory and a comparison of icons with paintings by Wassily Kandinsky, Pablo Picasso, Mark Rothko and Marc Chagall, and by Japanese artists influenced by Zen Buddhism, reveal intriguing points of convergence and difference. The reader will find in these pages reasons to reconcile Modernism with the Christian image and Orthodox tradition with creative form in art. Contents: Preface; Part I Preliminaries: The need to redefine the Christian image; The exemplary work of art; Enargeia and key concepts. Part II Theology and Art: The Orthodox icon and modernism; The new iconoclasm; Theological fallacies; Jacques Maritain’s dialogue with modernism. Part III Orthodox Iconology: Asceticism and iconoclasm; The mystical lives of beings in St Maximus the Confessor; The image in St John Damascene; The living image in Byzantine experience. Part IV Theophany and Art: Human and divine luminaries; The theophanic icon; Theophany and modernism; Enargeia and transcendence in Zen art; Epilogue; Bibliography; Index. Cornelia A. Tsakiridou is Professor, Philosophy, and Director, Diplomat-in-Residence Program, at La Salle University, Philadelphia, USA.